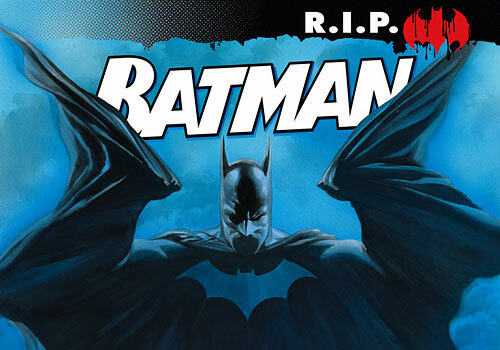 Just read Batman: R.I.P. from cover-to-cover. After 208 pages I’m left feeling … meh. I know there are lots of Grant Morrison devotees out there screaming at my words right now. I’m sure they’re frothing at the mouth about things like, “brilliant sub-text”, “metaphysical mind games”, or some such nonsense. For me it boils down to this, Grant Morrison wrote a disorienting story that once again explored Batman’s sanity, while at the same time shoved in 70 years of best-left-forgotten continuity. Being an old school comics fan, I’ll admit it was fun to see some of the pre-Crisis ideas again (like the Batman of Zur-En-Arrh). While it was cute, I still think they were best left alone. You get the sense that DC intended this story to be a big deal and talked about for years to come, but it failed to deliver on content. Sure there were some great moments, especially with the Joker, but I still couldn’t care less about Doctor Hurt and the Black Glove. Also the ending was anti-climatic and unfortunately wrapped too-much into the train wreck known as Final Crisis. I’m really glad I checked this book out from the library, rather than investing my own money into it. If anyone other than Grant Morrison had written this story, they would have been pulled off by the fourth issue. It’s worth mentioning that Tony Daniel’s artwork was gorgeous! Really great stuff! This story rode on Morrison’s coattails and was a disappointment. If you want to read Grant Morrison brilliantly explore Batman’s sanity, check out Batman: Arkham Asylum. I’d love to have a ranty response, but alas, I did not read Batman RIP. Not because of Grant, but because I don’t care that much about Batman. And last year was the height of my “Batman gets too much play” campaign. Which really wasn’t a campaign at all, more of a quiet boycott on my part. As for Grant, he is special, perhaps too smart for his own good. But I am a reference junkie. I find it fun to figure out all his references, even if I do need three different annotations to get them all. I understand though, someone as familiar with DC continuity as you are, that may be rather pretentious or something. Uh oh – I don’t think I’m smart enough to be here…lol! And you’ll probably send out a posse to do bodily harm to me if I tell you that even though my name might be Leiah, I’ve never seen any of the Star Wars movies so I’ll just keep that to myself. Thanks again for stopping by my place today. I’m going to delve a little deeper in here to see if I’m not a tech-incompetent as I think I may be. Hello! I am stopping by to thank you for visiting my blog! I cannot wait to check out your site! So far it looks fabulously entertaining! Have a great day! I guess I just wanted something more out of it. I liked the idea that Bruce has a defense personality though. I hate most Batman comics, but these sound just inane enough to rate consideration… for free… at a much later date. I love seeing the modern Batman look insane/idiotic, after all. I didn’t care for Arkham Asylum either, but the LOTDK arc “Gothic” was pretty good. One more thing– it’s easy to look smart when you’re holding all the cards and making cryptic references to arcane knowledge. Intelligence is utilizing the knowledge effectively. Writing impenetrable super-hero comics doesn’t make you a genius, but a failure at communicating your ideas. Drug use can be hell on articulation. More simply, Morrison wants to be Ra’s al Ghul, but he’s only the Riddler. The story had its moments, but it isn’t one that stuck with me. I didn’t like the art at all. Frankly, the best part of the “Batman Dies” event was Neil Gaiman’s two-part epilogue. That was beautiful stuff.